Aircon Servicing Singapore: Why Is My Aircon Sometime Cold But Sometime Warm? Why Is My Aircon Sometime Cold But Sometime Warm? Aircons have become quite an inseparable part of our daily lives especially during the summers. It’s not only important to make out lives more comfortable but often they’re quite necessary to maintain a “properly controlled room-temperature” for simple units like a high functioning PC. Problem is, like most aircon users, we realize that sometimes our friendly unit is blowing warm air instead of cold. If this is your first time encountering this problem then fear not, it’s probably something you can fix yourself. Let’s take a look why your AC sometimes blow cold air and sometimes not. Listed below are some of the most common problems that make your AC blow warm air. 1. Check the thermostat setting: Impossible as it may seem, the most common reason for “aircon blowing warm air” is because the thermostat setting is dialled in the HOT instead of the COOL setting. If you encounter the hot-air problem but sure that you didn’t put the setting in HOT check nonetheless. Some other member of the family or small animal could’ve switched it. In addition, if the unit is in ON mode instead of AUTO it would blow out air even if it’s not cool. 2. Checking the condenser and compressor: Once you make sure that your thermostat is at proper setting, check the condenser and the compressor. They are both located in the outside unit. Make sure that this unit is receiving power otherwise the system would function from the inside handler, which means it won’t be able to supply cool air. Next, check the condenser coil. Sometimes they get clogged by dirt or accumulated debris. This could have a serious impact on you aircon so make sure they are always clean. In fact, cleaning condenser coils during the hot seasons is almost mandatory. While you’re at it, check also the electric panel from which your unit is being powered. 3. Clogged air filters: An air filter does not necessarily “cause” hot-air-blowout. However, they do compromise the cooling capacity of the system. Dirt emanated from the filters can even clog the coils mentioned in the previous paragraph. Just because it’s an indirect agent, do not take it lightly. It’s one of the leading causes and can also lead to serious cold or allergic trigger among its users. A new and cheap air filter is easy to find and you can replace them yourself. There’s no need for professional supports. 4. Semi-compromised outside unit: This doesn’t necessarily mean your outside unit’s been damaged. Sometimes this part doesn’t have enough breathing space to supply adequate air into the system. Make sure that it’s not covered in dirt or grass or smothered by any tree branch. 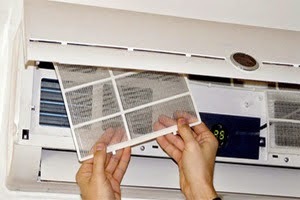 Keep the area around it clean otherwise your aircon’s longevity will be compromised. 5. Refrigerant problems: Problems in the compressor or leaks are the reasons for refrigerant malfunctions. The most prominent problem in this regard is that your AC is running low on refrigerant. It is possible that your system was undercharged during its production. If that’s the case then simply charge it to its proper standard. However, if the inappropriate level is due to leakage then simple refilling wouldn’t do. You’ll need an expert for this job. A professional would seal the leak, test it and then refill it with proper amount of refrigerant. The “proper amount” here is actually the amount specified by the manufacturer. Overcharging or undercharging the system would only make it inefficient so keep an eye out for this. Sealing leaks doesn’t cost much but of course you have to consider the expert’s help. Does Your Aircon have A Water-Sensor Switch? Not all ACs have this switch. When an overflow pan catches some spilled water due to a clogged condensate drain, these switches automatically shift to off mode. Most of the time this results in turning off the system but sometimes they target specific areas so that condensation would stop working. Although you cannot completely avoid all kinds of functional problems, it is always better to buy a government certified aircon even if they cost a bit higher than your expectations. You can find cheap uncertified ACs in the market but be wise and avoid choosing them. Even though they may seem a good bargain now, you may easily end-up spending a lot more after it in the future.